It’s been two days since I published my gift guide and I’ve made no progress on my holiday shopping list. I have, however, consumed lots and lots of this simple, maple-sweetened caramel corn. I can’t help myself! This is the one time of year that I wish I worked at an office, just for the homemade, powdered sugar-dusted cookies and chocolate peanut butter buckeyes. I’ve managed to appease my holiday cravings with my own homemade treats. Case in point? This popcorn. It’s dangerously easy to make and I’m powerless in the presence of its salty-sweet, cinnamon-flavored crunchiness. Most caramel popcorn is made with corn syrup, which is an ingredient I’d rather avoid, plus a lot of butter. 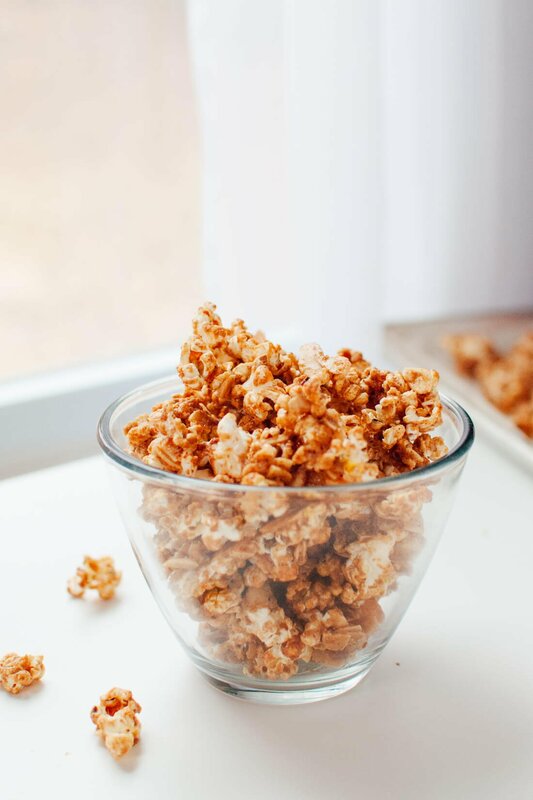 This healthier, dairy-free, homemade version is made simply with reduced maple syrup, nut butter, spices and freshly popped popcorn. And it is delicious. Feel free to change up your caramel popcorn! I added toasted, sliced almonds to match the almond butter, but you could leave out extra nuts or substitute your favorite (I bet pecans would be great). Once you’ve mixed the maple syrup mixture into the popcorn, you could add in some mini chocolate chips, cranberries, toasted coconut, sprinkles… anything that sounds good. Some notes on alternative sweeteners: If you don’t have maple syrup at home, it is possible to make this caramel corn with honey. I tried it and, as usual, the honey browned too quickly in the oven. I would suggest reducing your oven temperature to 325 if you want to try honey-sweetened caramel corn. You might need to bake it a minute or two longer, but keep a careful eye on it so it doesn’t start to burn. Also noteworthy, the original recipe called for brown rice syrup, which you could use, but I don’t recommend it because I’m concerned about the level of arsenic in concentrated brown rice syrup. (Actually, I’m concerned about arsenic in all rice products, but especially in concentrated forms.) Maple syrup to the rescue! 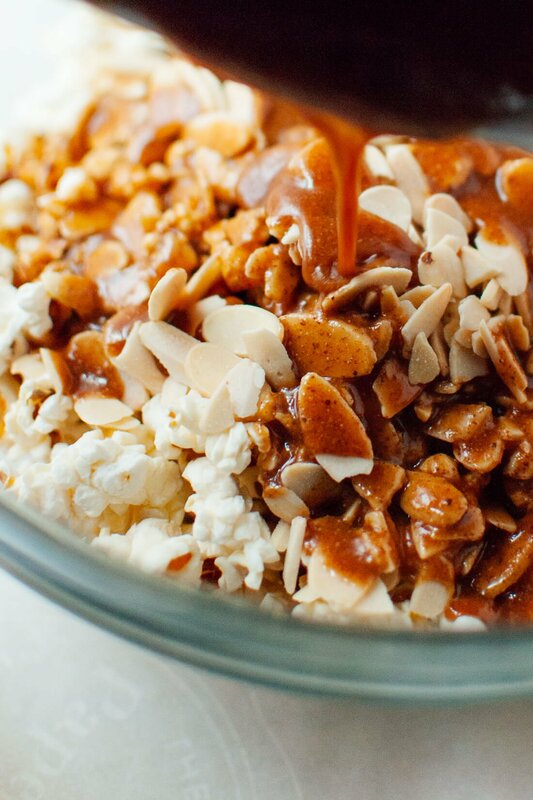 Naturally sweetened caramel popcorn made with maple syrup and almond butter! 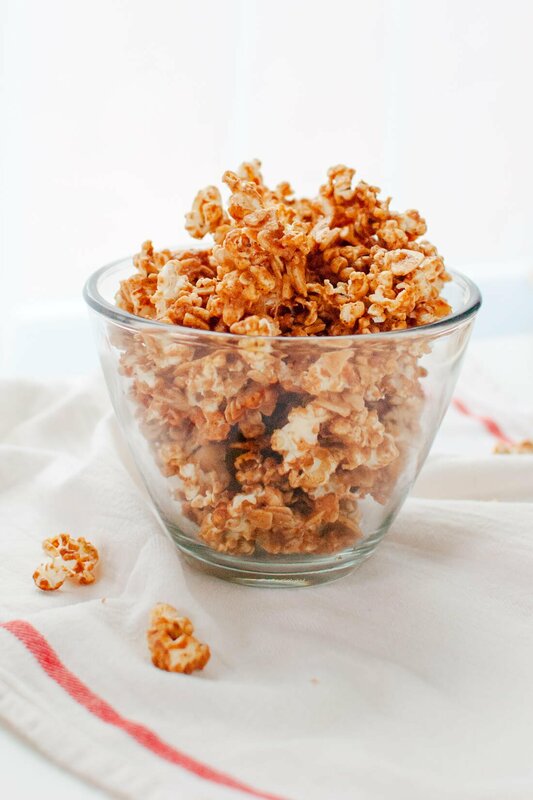 This healthier, vegan caramel corn is really easy to make. Feel free to use any nut butter you’d like. Recipe yields about 6 cups caramel popcorn. Toast the nuts: Once the oven has preheated, arrange the almonds (or other nuts) in a single layer on the parchment paper. Roast the nuts in the oven for 7 to 10 minutes, until fragrant. Keep an eye on them so they don’t burn. If you’re using whole nuts, chop the toasted nuts into small pieces on a cutting board. Meanwhile, pop the popcorn: First, place a large mixing bowl near the stove. Pour the oil into a large, heavy-bottomed pan with a lid. Turn the heat up to medium, add 2 kernels of corn, and cover. Once the kernels pop, remove the lid and pour in the remaining popcorn kernels. Cover the pot and give the pot a little shimmy to distribute the kernels evenly. To make the caramel sauce: In a small, heavy bottomed pot, bring the maple syrup to a boil over medium heat. Keep a watchful eye on the syrup and continue boiling for 2 minutes and 30 seconds, reducing heat only if necessary to prevent overflow. Remove the pot from heat. Add the nut butter, vanilla extract, salt and cinnamon to the pot of maple syrup. Whisk until well blended. Add the nuts to the popcorn, then drizzle the maple mixture over the popcorn and nuts. Toss with a rubber spatula or big spoon until well mixed. Pour the popcorn onto the parchment-covered baking sheet and arrange it in a single layer. Recipe adapted from At Home in the Whole Food Kitchen by Amy Chaplin. Make it nut free: I think sunflower butter would work in place of the almond butter, but I haven’t tried. You’ll also want to skip the toasted nuts or use toasted pepitas or sunflower seeds instead. Storage suggestions: This popcorn is best when fresh, but it keeps well in a sealed plastic bag (squeeze out as much air as possible) for a few days. If you love this recipe: You’ll also love my Peppermint Bark Popcorn, Lemon, Parmesan and Black Pepper Popcorn and Stovetop Popcorn with Chili Powder and Dark Chocolate. 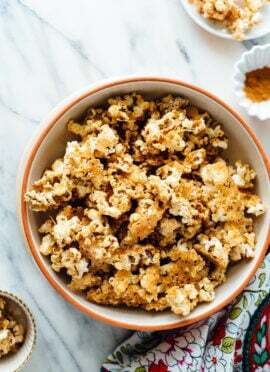 Caramel Popcorn is one of my favorite ways dress up ordinary popcorn – love the maple and cinnamon additions – sounds amazing! I’ve always wanted to try brown rice syrup as an alternative sweetener but thanks for the heads up! Will definitely do more research about it before I decide if its worth buying. I was literally researching brown rice syrup while I was standing in the sweeteners aisle at Whole Foods. I think the syrup really crisps up well, so it’s good for granola and caramel popcorn, but it’s like 20 times more concentrated than plain brown rice so the arsenic content is cause for concern. My boyfriend loves popcorns, he always eats a big portion when we go to the movie theater. A simple kind, just salt and I-don’t-know-which-fat. But this vegan healthy sweet version makes me want to try them! I haven’t had real Maple Syrup is so long, this will be perfect reason. Thanks, Robyn! I bet he’ll love it. Popcorn with maple and cinnamon sounds so delicious! I would love to try this. 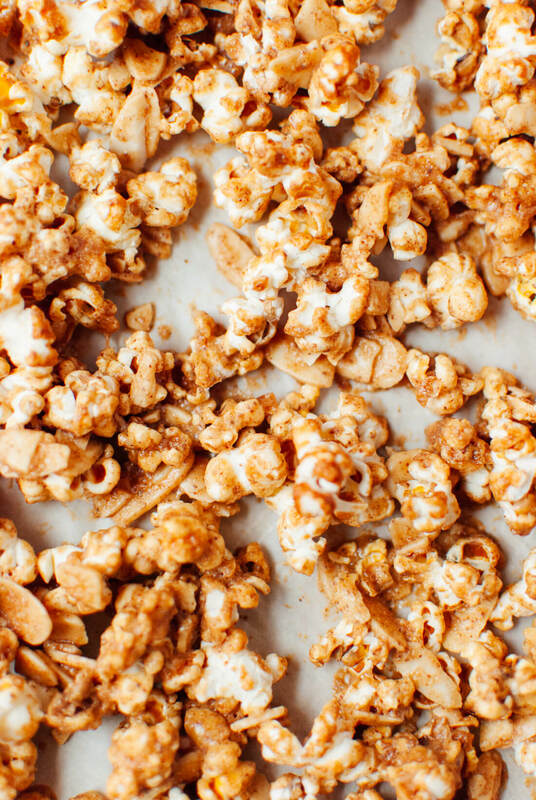 Maple syrup is my go to sweetener and your popcorn sounds fantastic! Kate! My Mum is going to love this! Here in Australia we have a caramel popcorn called ‘Lolly Gobble Bliss Bombs’, quite self-explanatory really, they are bliss bombs, and you totally gobble them up! 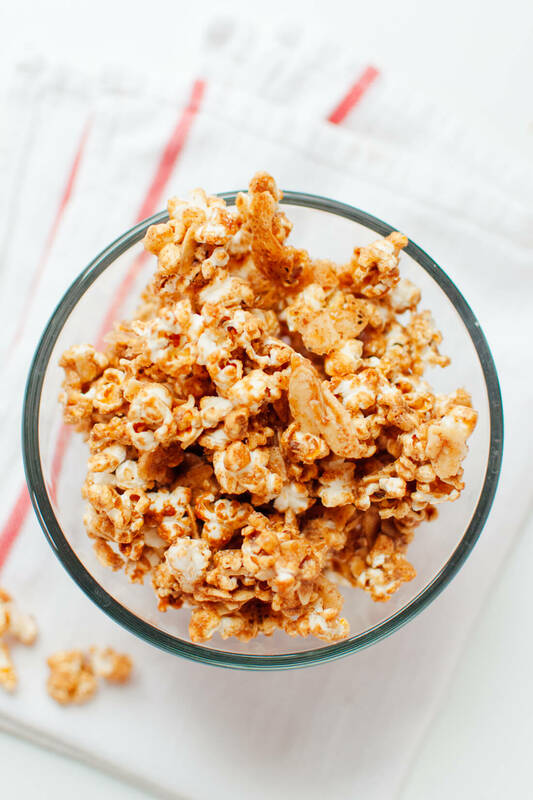 I love caramel popcorn and I love that this is a healthier version! Sounds so delicious! This recipe is unbelievable! First off, I LOVE that you use real ingredients like maple syrup and almond butter! That combination is simply amazing!! Secondly, your pictures our out-of-this-world. I want to double-fist handfuls of this into my mouth…because who doesn’t do that with popcorn?!? Great job!! Oh dear… I must try this recipe now! Hi Kate! This looks amazing – I’m going to make a big batch and give it out with Christmas gifts. I was just wondering how long you think it would stay good in mason jars or other containers? I need this with a movie tonight!! 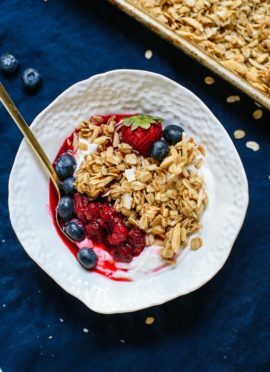 Ohh, it’s looking delicious again… I love that you not only provide us with healthy recipes, but when holidays are calling, you occasionally give sweet-toothed recipes as well (but with a more healthy twist than most original recipes). Apart from that, I was wondering where Cookie is in most of your posts. In my memory, your older recipes tended to be loaded with sweet pictures of Cookie, and the newer ones less. My housemate gets exceptionally enthusiast for Cookie-dense posts, which means I mostly make your older recipes (which is no problem, since they are as delicious as the newer ones). This is one heck of a tasty looking snack. I absolutely love the almonds in there! Hooray for caramel corn! Ordinary buttered popcorn is a staple snack at our house, so you know I am all about this for a festive alternative. Love the idea of mixing it up with nut butter! First, let me say I’m a huge fan of cookie + Kate. But I tried this recipe and personally, I found the flavour of the nut butter “muddied” the taste of the caramel corn. I used the almonds, almond butter, and maple surple…I’m sorry, I was disappointed. 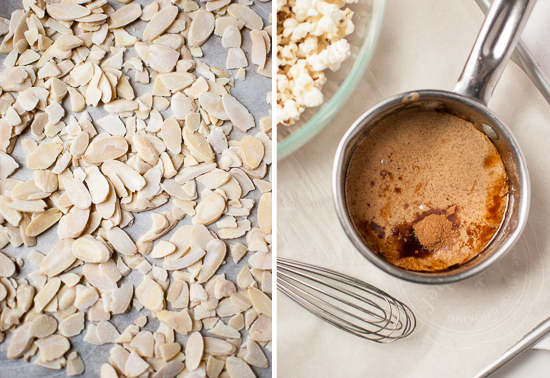 I think if I were to make it again, I’d cut the nut butter completely and simply use the syrup and cinnamon to coat the popcorn. Hi Rose, I’m so sorry you were disappointed with this one. I understand where you’re coming from, although I thoroughly enjoyed the nut butter and maple combination. Before your go through another 1/2 cup of maple syrup, I thought I’d mention that I tried a batch without nut butter and it didn’t work for me. The boiled maple syrup was still far too liquid-y and drowned the popcorn. The kernels just shriveled up on contact, so I do believe the nut butter is necessary in this recipe as written. You might be able to cook the maple syrup longer to condense it, but it would might be tricky to get it just right. 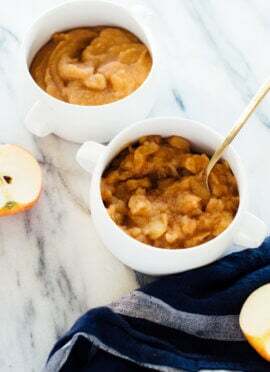 Another idea would be to use cashew butter instead of almond butter—it has a more neutral, creamy taste that you might enjoy better with the maple. Apologies again that this recipe didn’t meet your expectations! Wow, Kate, thanks for posting a reply – and so quickly, too! You might just be right about using cashew butter instead of almond butter, never considered that, but it makes sense. (I guess having good ideas like this are why you have a blog and I don’t!) Definitely worth a shot! Happy holidays to you and everyone you love and hold dear. Thank you, Rose! Happy holidays. It didn’t work for me…I followed this recipe to a tee but the caramel sauce wasn’t close to “drizzle mode”. After I put in the 3 tablespoons of nut butter, it came to the consistency of the almond butter, which was challenging to cover the popcorn. I like the concept and the taste is very satisfying but my version would not be suitable for guests. Any suggestions? Cate, I’m so bummed to hear that! I’ve made this popcorn four times, with almond butter and peanut butter, and that never happened to me. I tried a version without any nut butter at all, but the maple syrup mixture was too thin and just drenched the popcorn. So I’d say that some nut butter is necessary. In your case, I think you might have better luck whisking in one to two tablespoons nut butter, until it’s nice and creamy but still plenty spreadable. Please let me know if that works better for you—I’m so sorry the first batch didn’t work out like mine! I haven’t tried this recipe yet, but wanted to share my thought on the nut butter. I always buy the fresh grind almond/peanut butter at Whole Foods, which is THICK. But the all natural almond/peanut butter from Trader Joe’s is much thinner and free flowing and favored by many food bloggers. I know I’ve run into problems using the fresh grind nut butters in recipes that were tested with something else (not necessarily C&K recipes, but recipes from across the interwebs). I would suggest trying a different variety of nut butter. That makes sense, Mandy! I used Trader Joe’s almond butter and some natural peanut butter (it was also pretty drizzly) during recipe testing. Actually, though, I also used freshly ground cashew butter from Whole Foods and it worked fine. Maybe cashew butter is the exception. I love that you used nut butters and maple syrup! genius! I can’t wait to try this. I hope your having a great holiday season. Feeling pretty pleased that I always keep popcorn kernels and maple syrup on hand. Guess what I’ll be snacking on after work tomorrow night! I’ve been looking for a recipe like this for a long long time. The nut butter is amazing. Thank you so much for posting and have a great holiday! Hi Kate, I tried this recipe and it didn’t work for me, but I think I know the problem. I didn’t perfectly measure out the peanut butter, so I added more than 3 TBSP. The liquid mixture didn’t drizzle over the popcorn but fell out in clumps and wouldn’t incorporate. Even so, my family couldn’t stop eating it exclaiming how delicious it was. I am going to try this again with less peanut butter. Hi Lisa, I’m sorry to hear it didn’t work perfectly for you! I hope your suspicion is correct. If your peanut butter is particularly thick rather than gooey, you might want to use just a little less than three tablespoons. I love your recipes and this one sounds great…I was wondering if I could air pop the popcorn instead of popping it on the stovetop with coconut oil. I’m so sorry for the belated reply, Carol. Yes, that should be just fine! So glad I came across this recipe. I made it for my sister who’s vegan and she loved it. I didn’t even need any oil since I air pop my popcorn. Will definitely make it again! YUM! Finally got round to trying this today and it is delicious- Imy kids have proclaimed that I am officially not a mean mum today- makes up for feeding them broccoli last night! Thanks Kate. Haha! Glad to hear it, Rachel! I made this tonight for a girls night in. We loved it!! So good!! Awesome, glad you all enjoyed it! Just made this for my kids while we watch Narnia. My youngest has been dairy free for a bit over a week, so very new to dairy fee cooking. I wasn’t expecting much of this recipe, but the kids and I love it!!! It’s perfect balance between sweet, salt and nut. I didn’t quite have enough maple syrup so made up the difference with raw honey. So good!!!! On a whim and an invite to go mountain biking for the day with some new friends, I made a batch of this for ‘energy’, as we all joked. It was perfect – I used almond butter, and added toasted pecans and toasted coconut. The light texture and moderate sweetness made this batch disappear. Thank you for all your excellent recipes and details. I look forward to each blog post for inspiration and new ideas! I am munching on this popcorn now. Yeah it is pretty yummy. I made it using organic pure peanut butter. Thank you yum yum yum! So glad you enjoyed the popcorn, Shelley! Oh My Goodness! I just made this and it is wonderful! Thanks for another great recipe. That is a very real risk. :) Hope you love it! PS – My kids gobbled it up. So I think next time we’ll have to double it! Thank you, Alexa! That’s great to know! What a delicious recipe!! I used almond-hazelnut butter and added a handful of mini chocolate chips to the mix … it melted into a delicious “Nutella-like” sauce – yum!!! In place of the toasted almonds, I’ll have try it with toasted hazelnuts next time! Thank you, Susan! Your chocolate hazelnut version sounds amazing. Happy holidays! I’ve been refined-sugar free for almost a year and the treat I’ve missed most is caramel corn. Thank you for this recipe using maple syrup! I can’t wait to try it! Thank you, Laura! I’m so glad you all are enjoying it (even if you’re enjoying it too much ;) ). Hi Kate! Is there anything that I could use instead of the maple syrup? (homemade syrup?) BTW….this recipe looks so delishious!! Can’t wait to try it! Hi Ana! Honey might work. Otherwise, I’m not sure. Made it. Tried it. Loved it. Finished it before the movie started. Made this tonight and it turned out perfectly! The cinnamon added a little extra flavor and even more yummy! Will definitely be making it again! This caramel popcorn is the BEST ever!! I make it at least once a week for our family’s movie night. It’s a favorite. Thanks! By the way, I always use a mixture of either maple syrup, honey, and/or molasses. Never fails! Sounds like a great tradition! I’m so glad everyone loves it. This recipe was absolutely perfect! Popcorn was crispy and I added natural peanut butter which was such an amazing touch! Sooo good! This was amazing. Came out perfectly! My children love it! That’s great! Thank you, Tara. I am happy it was a hit with your kids. Absolutely AMAZING! The flavors and textures are perfectly balanced between sweet, salty, crunchy, and chewy. I just made half a recipe (using 1/4 cup popcorn kernels) and it was great. I’m not even vegan, and I gobbled this up with glee. Thanks for sharing! Absolutely fantastic, easy, and addictive. We use the still-hot pot used to make the popcorn to make the topping (the maple syrup will start to boil right away). Didn’t even get around to baking it…. just gobbled it up after adding the topping. Wonderful recipe! It’s so addictive and a great treat. Thanks for sharing, C. Michele. Make this the other day and it was so good! I want to give it as Christmas gifts. Is a plastic bag better than a glass mason jar for packaging for gifts? What would you say the shelf life is? Thank you. What a fun idea! I think a mason jar is a great idea! Adds an additional element and keeps the popcorn more intact. Thanks for your review, Christine! This popcorn is soooooo goood! The only thing I would change next time is a bit less maple syrup, it was too sweet. I think it would still be really yummy with 1/8 cup less syrup… Anyway, way healthier than regular caramel corn! Thanks for the great recipe! You’re welcome! Let me know what you think of it on a cake. I would be interested! I made this with sunflower butter and it was next level delicious. I needed to reduce the time to about 6 minutes total as mine started to burn. Maybe it has something to do with the sunflower butter. That could be. Thanks for sharing, Stephanie!